Watermark of a stylized swan below an arrow and above "N". Inscribed at the bottom edge: "I due canali da empire il bicchiero che sono segnati A, e B. denotano che da uno di essi si deve mettere il vino bianco/dall'altro il rosso, et cosi uno che sarà il rosso empirà l'Aquile et i serpenti, et l'altro empirà il resto di vino/bianco" ("The two tubes to fill the glass with are marked A, and B. and show that white wine should be poured into one/and red wine into the other, so that the red will fill the eagles and snakes, and the other will fill the rest with white wine"). "A" and "B" on top of the ewer. On top of a gnarled tree, an eagle stands with outstretched wings. With its claws, the imposing bird attacks a coiled serpent. Two putti pull at the wings of a second eagle that carries a pair of entwined spouts on its back. 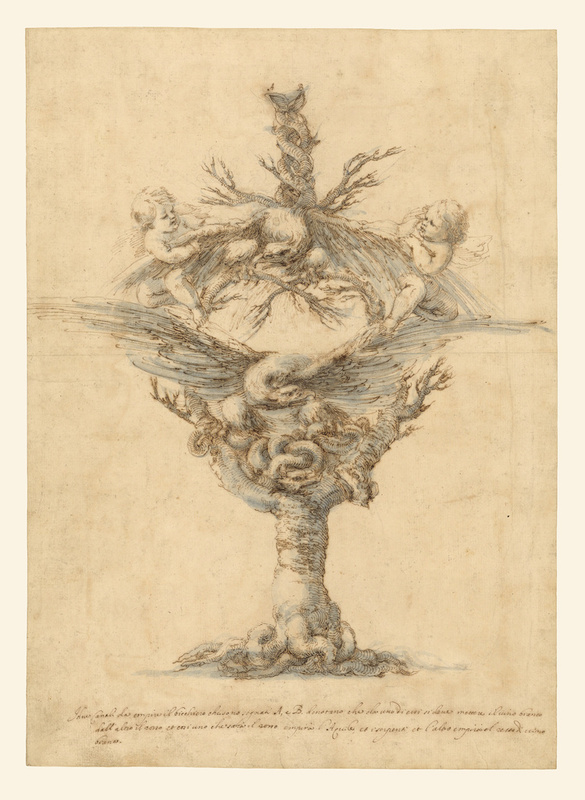 This fanciful scene is a design for a glass cup and is explained in the inscription at the bottom of the sheet: white wine should be poured into one tube and red wine into the other, so that the red wine fills the eagles and snakes, and the white wine fills the rest. Stefano della Bella began this work by creating a preliminary sketch in black chalk. He then worked the sketch using a finely sharpened quill pen. Avoiding hard outlines, della Bella used tiny hair-like strokes for the contours to define the forms. A blue wash evokes the presence of liquid inside a transparent shell. Della Bella made this design for a member of the Medici family in Florence. Elaborate glass table ornaments were common at the Medici court and often accompanied ceremonial banquets. However, this drawing's complexity suggests that a goblet constructed to its fantastic design never graced the tabletop at a Medici feast. Instead, it served as an example of artistic ingenuity, admired by the patron as proof of della Bella's imaginative powers. Sir Robert Stayner Holford, English, 1808 - 1892, by inheritance to George L. Holford.